Investors trying to figure out which stocks to buy in 2013 amidst warnings of a rocky year can take advantage of a consistent market pattern that's just turned positive. It's called the "best six months strategy." 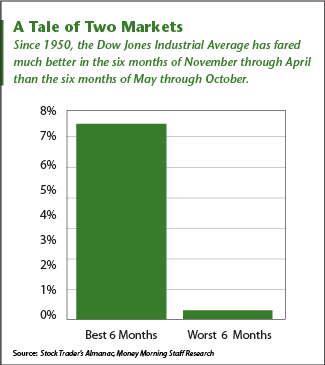 Simply put, the markets — and the Dow Jones Industrial Average in particular — perform much better in the November-April period than the May-October period. The May-October slump, in fact, gave rise to the old investing axiom, "sell in May and go away." But most investors don't realize they can use the consistency of the pattern, and its oscillating nature, as an investing strategy. "We've found that most of the market's gains are made from November to April, whereas you either go down or are flat from May through October," Jeff Hirsch, editor-in-chief of the Stock Trader's Almanac, said in an interview on Breakout. The historic discrepancy is larger than one might think. Stock Trader's Almanac analyzed the performance of the Dow Jones from 1950 through 2011 and found that the November-April period showed an average increase of 7.5%, compared to a meager 0.4% average gain for the May-October period. "It's a pretty robust strategy," Hirsch said. "It's worked over the years. It's one of the most consistent things we've seen." Still, the best-six month strategy is not as easy as simply selling on May 1 and buying on Nov. 1. Investors need to keep an eye on macro events and use technical indicators for the best times to get in and out. In some years, Hirsch said, it's better to re-enter the market in October. This year is unusual in that it's an election year, which tends to put a crimp in the cycle. And sure enough, the Dow Jones fell more than 650 points in the two weeks following the re-election of President Barack Obama. Knowing that might happen, Hirsch said he waited longer than usual this year to get back in. What's more, as we enter the best six months for stocks in 2012-2013, the headwinds for the markets are unusually strong. Investors are anxious about everything from the Eurozone debt crisis to the fiscal cliff. That means Hirsch is moving particularly cautiously on his stocks to buy now. "We're going in with a little tighter stops with our trades," he said. A trading stop, or stop-loss order, is a standing instruction left with a broker to sell a stock when it falls to a certain point. Any investor that wants to use the best six-month strategy this year will need to choose carefully and use defensive tools like trailing stops to achieve optimum results. Money Morning Chief Investment Strategist Keith Fitz-Gerald recently offered several ideas on stocks to buy and how to reduce risk when trading in today's uncertain markets. First, Fitz-Gerald says investors need to resist the temptation to jump out of the market completely. "I think that is the worst possible thing an investor can do," Fitz-Gerald said. "You need to be in the markets. And you need to be in the markets for appreciation and income. But you also need to use things like trailing stops, for example, that automatically make that decision for you." There will be good stocks to buy even in the kind of unsettled markets we have now, he said. "I don't want to second-guess the market, but I do want to build on the fact that there are intelligent people, resourceful corporations, that have lots of cash and are going to continue to invest in our future." For now into early 2013, Fitz-Gerald said he recommends investors mostly stick to what he calls "glocals" – large U.S.-based multinational companies with a local presence. "To the extent we're buying, it's the large mega-caps," Fitz-Gerald said. "It's in the industries that the world has to have as opposed to wants to have – so that speaks to energy, certain types of medicine, certain types of technology." To help investors focus on the stocks to buy that offer the best opportunities, he offered an analogy to the California gold rush of the late 1840s. "Look at the guys who are selling the picks and shovels right now, don't look to the guys who are going to the hills to try to make a billion dollars," Fitz-Gerald said. Does Post-Election Market Drop Mean It's Time to Buy? I would have liked to have had you list the stocks you thought were the best to buy in 2013.